Writing in The Atlantic seven decades ago, the former Chinese First Lady warned against income inequality—a force that continues to threaten the country's stability today. Throughout her 105-year life span, Soong Mei-ling never held elected office or any official government position. Yet few individuals exerted a bigger influence on 20th century Chinese history. As the wife of Chiang Kai-Shek, the man who ruled the Republic of China for nearly a half-century—first on the mainland and then in Taiwan—Soong served as a vital liaison between her country and the United States—a role she was uniquely suited for. Born into a prosperous Shanghai family in 1898, Soong spent much of her childhood and early adulthood in the United States, where she attended boarding school in Georgia and later studied at Wellesley. Following her return to China, Soong eventually married Chiang, a military general who had assumed leadership Republic of China in 1927 following the death of the Republic's founder, Sun Yat-sen. Beautiful, Christian, and fluent in English, Madame Chiang compensated for a husband, who, despite great military prowess, was relatively provincial and unsophisticated. Sino-American relations came to a head during the second World War, when the two sides fought together against Japan. Yet despite their common enemy, China and the United States were uneasy allies; China felt that the U.S. devoted insufficient resources to their cause, while in Washington the Roosevelt Administration distrusted the corrupt and ineffectual Chiang. During these years, Madame Chiang served as a translator and spokesman for her husband, whose tempestuous relationship with the American General Joseph Stilwell threatened the effectiveness of the alliance. While as a nation we are resolved that we will not tolerate foreign exploitation we are equally determined that within our country there be no exploitation of any section of society by any other section or even by the state itself. The possession of wealth does not confer upon the wealthy the right to take unfair advantage of the less fortunate. But neither, as a nation, does China believe in communism or wish to obtain it in our land. We have no use for most -isms which pose as panaceas for all the ills of the human race. In fact all forms of authoritarianism adopted by some European countries, Japan, and certain Latin American republics (which in late years have flirted a little, discreetly perhaps, with dictatorship) leave the Chinese people cold. 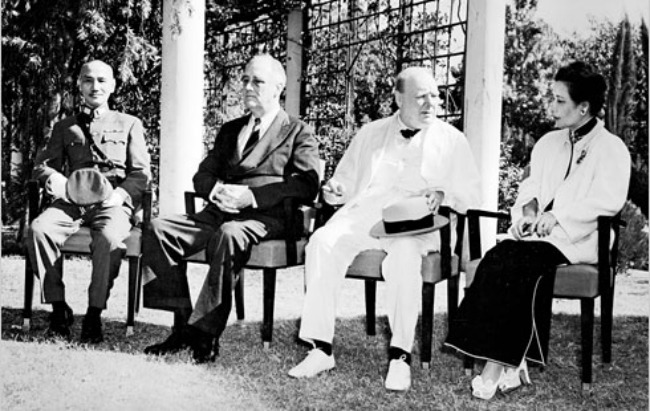 Madame Chiang's argument fell kindly on American ears, as Washington then envisioned an alliance with China as a centerpiece of its post-war world order. But Madame Chiang's blithe dismissal of communism proved premature. Just three years later, following Japan's surrender in World War Two, a civil war between Mao Zedong's Communists and Chiang Kai-Shek's Nationalists engulfed China, leading to enormous human casualties in a country already devastated by occupation and war. When the Communists appeared near victory in early 1949, Chiang and the Nationalist leadership fled to Taiwan, where the Republic of China established an authoritarian government. Madame Chiang never set foot in mainland China for the rest of her life. From Taiwan, Madame Chiang continued her advocacy for the Nationalist regime in Taipei, which the United States recognized as the legitimate government for all of China until 1979. By then, Chiang Kai-Shek had died and rule of Taiwan fell to his son from an earlier marriage, Chiang Ching-Kuo, who launched modest political reforms that paved the way for the island's eventual democratization. But Madame Chiang, who by this point had settled permanently in New York City, continued to influence Taiwanese politics, and when the younger Chiang died in 1988 the former First Lady attempted to re-engage in Taiwanese politics, which proved unsuccessful. Then 90, Madame Chiang would, remarkably, live another 15 years. In 1995, the 97-year-old delivered a speech to Congress, and at the age of 103 she presented her artwork in a New York gallery opening. Upon her death from complications from pneumonia in 2003, Madame Chiang had the unusual distinction of having been alive in three different centuries. Born in China during the Qing Dynasty, she lived long enough to see George W. Bush's America. After a long, eventful life, it isn't surprising that Madame Chiang leaves behind a complicated legacy. Laura Tyson Li, a journalist who wrote a recent biography of the former First Lady, told me that she was probably more popular within the United States than she was in China, where her husband's oppressive and corrupt rule had alienated a large part of the population. And despite the egalitarian spirit of her Atlantic essay, Madame Chiang in practice expressed little sympathy for China's poor. When Eleanor Roosevelt asked her how she would deal with striking Chinese coal miners, the Generalissimo's wife cooly drew her finger across her throat. Ironically, Madame Chiang lived long enough to see Communist-led China evolve into a society where income inequality, the force which ultimately doomed her husband's rule on the mainland, has re-emerged as a major social problem. In fact, her belief that “the possession of wealth does not confer upon the wealthy the right to take unfair advantage of the less fortunate,” could fit neatly into a speech by Xi Jinping, China's current president. Something tells me, though, that President Xi wouldn't bother crediting Madame Chiang for the line. I have asked a friend in America to renew my subscription to the “Atlantic Monthly” for a further three years. Please see whether this has already been done. If not, please have the subscription renewed for three years and send me the bill direct. We used the “Atlantic” at Wellesley in Freshman English, and since then I have become so accustomed to having it by my side that I invariably keep a copy near to fill in spare moments between engagements. The letter remains framed on the wall of our Washington, D.C., office.